More player-requested features on World Golf Tour, including all new hole locations on Merion, new practice Mulligans, and the latest virtual equipment from TaylorMade and MAX Meter for top players. 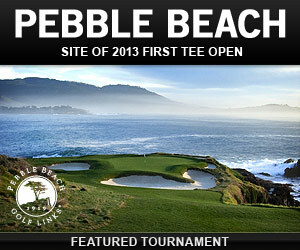 Did we mention Pebble Beach? We've added a new set of hole locations on Merion Golf Club, site of the 2013 U.S. Open. Replay Merion for exciting new shots and challenges in the special Merion New Holes Challenge tournament going on now. 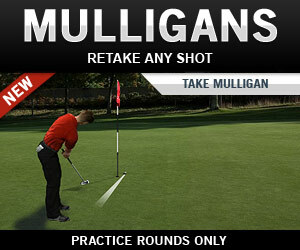 Practice more golf shots with the new Mulligan feature. A Mulligan allows you to retake any shot, is available in single-player practice games only, and doesn't impact your stats. Mulligans are free but count as an extra hit on the ball you're using. 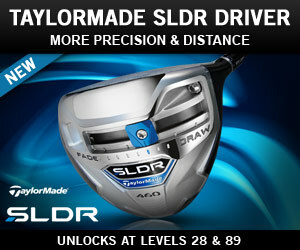 Get more forgiveness and distance with the new SLDR driver from TaylorMade. Great for players who like to control shots with early or late swings. Unlocks at Level 28 and Level 89. 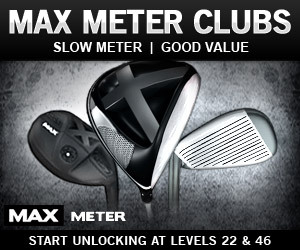 Get a slower WGT swing meter, plus more distance and more performance with the new MAX Meter clubs, including driver, woods and irons. This top virtual club set starts unlocking for players at Level 91. 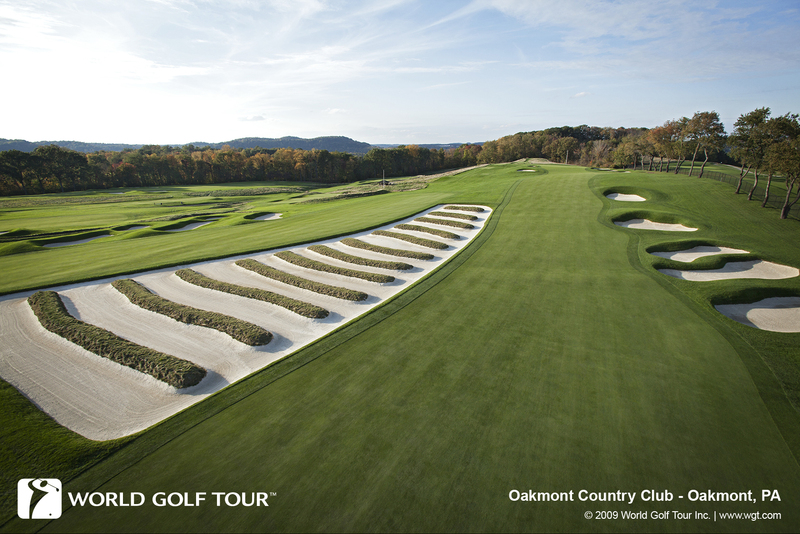 Play America's top-rated golf course, and the site of the First Tee Open in September on the Champions Tour. Look for this quick closest-to-the-hole tournament with double WGT Credit prizes by tier, on a little slice of heaven. Course Management is an often overlooked but critical aspect of golf. The key here is to think strategically and put yourself in positions where it is easy for you to score well. This is one area where I've discovered that virtual golf and real golf have a lot in common, so I'm excited to hear what WGT players think when it comes to virtual course management. We work with thousands of professional and amateur golfers at The Leadbetter Golf Academies, and the best way we've come up with for course management is to think about each hole backwards before you hit your tee shot. Break each hole down into your ideal putt, your ideal approach shot, and your ideal tee shot. One of my favorite parts of WGT is how easily you can use the Mini Map and the Zoom feature to check out the hole...wish we had that feature out on the real course. Your Ideal Putt – What's the break of the green near the hole? Your Ideal Approach - Where is the hole located on the green? Your Ideal Tee Shot – What's the best tee shot given your ideal approach and ideal putt? One of the professional golfers I've been fortunate to work with since 2007 is Suzann Pettersen, an amazingly talented player with incredible distance. While we obviously work on all facets of Suzann's swing and game, it's probably her focus on course management that's helping her contend and win tournaments. There's a time to use your distance, and also times to put yourself in the best position to score well. Finding that balance is the key to course management. Please try this tip in your next virtual (or real) round of golf and let me know how it works. I am confident it will lower your score. But I would love to know what other ideas you have related to course management and strategy. 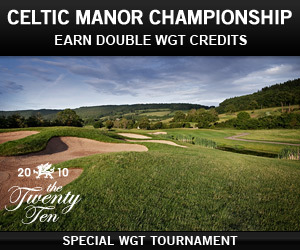 Play the Celtic Manor Championship tournament on WGT this week while you watch the Wales Open on the European Tour. Compete against players in your same WGT tier to earn double WGT Credits in this free, closest-to-the-hole tournament. The Twenty Ten course at Celtic Manor is the site of this year's Wales Open tournament, and the site of the 2010 Ryder Cup. *Special tournament runs now thru 9/15/13, is free to enter and open to WGT players in all countries. WGT partner Michelin is hosting The Michelin Challenge tournament on WGT this month, with a total purse of more than 100,000 WGT Credits. Play this free 18-hole stroke play tournament on Merion, host of the 2013 U.S. Open. Play as many times as you want to post your best score, competing only against players in your same WGT tier. The top 70 scores in each tier will split the total purse. 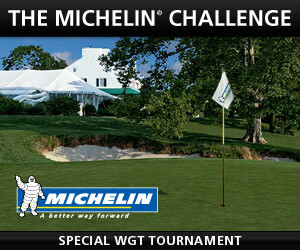 *The Michelin® Challenge tournament is free to enter, open to WGT players in all countries and runs thru 8/31/13. See rules for more details. The summer is ending and it's your last chance to get the popular all-black TaylorMade R1 driver, before it's removed from the WGT Pro Shop at the end of August. The limited edition black TaylorMade R1 virtual driver is a WGT player favorite and features more distance and forgiveness for top performance, unlocking at Levels 11, 48 and 93. 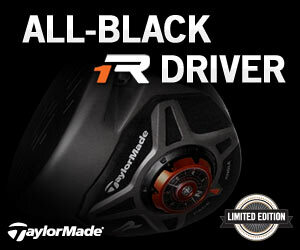 TaylorMade All-Black R1 Drivers unlock at Levels 11, 48 and 93 and are available in the Pro Shop thru 8/27/13. 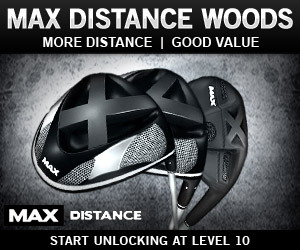 The new MAX Distance Woods on WGT offer maximum distance at a great value. 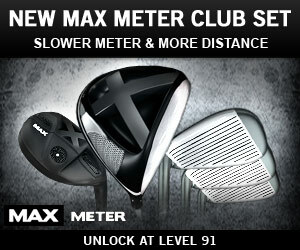 The new MAX Meter clubs help slow down the WGT swing meter, with extra distance and forgiveness, at a great value. The sleek, all-black clubs are available in a complete set, including Driver 3 Wood, Hybrid and Irons, all available now in the Pro Shop unlocking starting at Level 22 and Level 46. The golf editors at Golf.com have compiled their 2013 list of the Top 100 golf courses in the world. WGT is thrilled that 10 of the Top 100 courses, and 4 of the Top 10 courses, are available on World Golf Tour, including St Andrews (#4), Pebble Beach (#7), Oakmont (#8) and Merion (#9). 81. Harbour Town, Hilton Head Island, S.C.
57. Olympic (Lake), San Francisco, Calif.
43. Kiawah Island (Ocean), Kiawah Island, S.C.
36. Bethpage (Black), Farmingdale, N.Y.
9. Merion (East), Ardmore, Pa.
7. Pebble Beach, Pebble Beach, Calif. 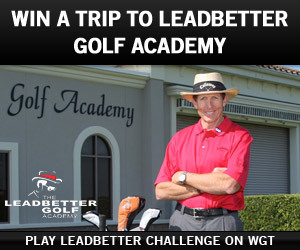 Play in the first Leadbetter Challenge tournament on WGT for your chance to go to The Leadbetter Golf Academy. 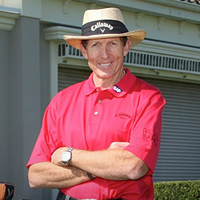 David Leadbetter is one of the top golf instructors in the world, and is the new virtual golf instructor on WGT. To celebrate, WGT is running a free, unlimited stroke play tournament on St Andrews. The top leaderboard score, plus one lucky sweepstakes winner will each get a grand prize trip for two to The Leadbetter Golf Academy in Orlando, Florida. We're not stopping there though... Another 20 lucky sweepstakes winners will get Callaway and Odyssey virtual clubs on WGT, so don't miss this one! *This special tournament is free to enter, runs thru 10/31/13, and is open to WGT players in all countries. See tournament rules for prize eligibility and travel details.